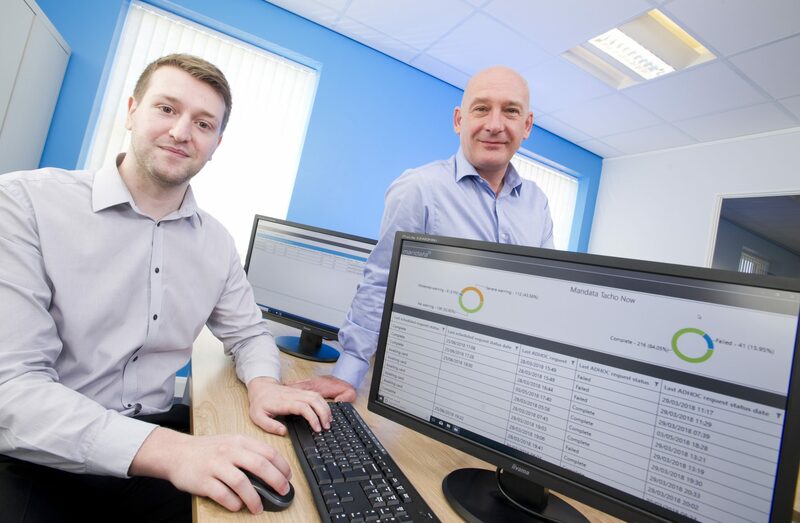 Pictured are Mandata’s Kevin Marshall, development director and Carl Jameson, web services developer, showcasing the company’s new Tacho Now download service. The transport management technology specialist’s new digital tachograph download service significantly improves the systemised capture of driver and vehicle tacho data. The service, which automatically collects tacho data for road transport operators, helps to ensure that they have the relevant data needed to remain compliant with EU regulations. Digital tachographs operate by storing data on the driver and the vehicle in their own memory and separately on a driver’s smart card. Transport operators must download this information from the digital tachograph every 90 days and from the driver cards every 28 days. This is then analysed to ensure compliance with law. Using Mandata’s new tacho download service Tacho Now, driver data is automatically collected from tachographs on a weekly basis and vehicle unit data is collected on the first day of each month. This reduces the burden on the operator of having to continually arrange and collect data from vehicles and drivers out on the road, and all the associated administration time and costs, while eliminating the risk of information being lost or containing gaps. One-off or ad-hoc downloads can be performed by the haulier via a secure web portal at any time as and when required for third-party analysis. An automated warning is also flashed to the road transport operator as part of the service if a vehicle’s 90-day or a driver’s 28-day limit is approaching and there has been no download in that period, further improving the tacho download process. Charts also make it easier to spot any issues that need to be addressed by the haulier. The Mandata Tacho Now download service is available to users of its software on a monthly subscription basis.